Gaikai's Dave Perry took the stage to announce a bunch of new "social" features for the PS4 today: including Ustream/Facebook support, streaming capabilities, and and "remote play," which allows you to play PS4 games on your Vita. "Our vision is to create the first gaming social network with meaning," he said. 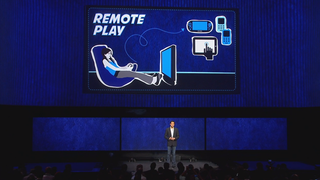 Perry said the long-term goal is to make "every PS4 game" playable on the PlayStation Vita.